Told you Saturday that, although the Maestro himself can’t specifically recall it with certainty one way or the other, it appears that Vin Scully did more than just broadcast Bryce Harper’s first Major League game ever, at Dodger Stadium, on Saturday night. He appears to have also broadcast Mickey Mantle’s first (exhibition) game ever in New York, and his first appearance ever inside an actual big league ballpark. In the late ’40s and early ’50s the Yankees and Dodgers would open up with a three-game series, right before Opening Day. In 1951, they began it on Friday, April 13, at Yankee Stadium. Mantle was flying back from Kansas City after a visit to a draft board, and missed that game. But he played at Ebbets Field in Brooklyn on the 14th and 15th. The Dodger announcers in 1951 were Red Barber, Connie Desmond – and Vin Scully. There was no reason Vin should’ve been off the broadcasts that weekend, and now there is more evidence that he would’ve been very much needed in the both. In those days, those three men handled all of the radio and television for the Dodgers, switching from one to the other every few innings. Sure enough, the impeccable Bill Francis of The Baseball Hall of Fame has dug up what I could not: Confirmation that the Dodgers-Yankees exhibition of April 14, 1951 – Mantle’s unofficial debut – was televised. Check out the entry for 1:30 PM on Channel 9, from The New York Times weekly tv listings, published on April 8, 1951: Channel 9 was WOR-TV, and they carried the Dodger broadcasts (the Yankees and Giants were on WPIX-TV, Channel 11). Meaning that the odds that Vin Scully wasn’t at both Harper’s debut, and Mantle’s New York debut, have shrunk to just about nothing. It was not the most outlandish forecast of all time. Predicting in March that Bryce Harper would be called up on April 25 was a less than even-money wager (and it was wrong, by two days). 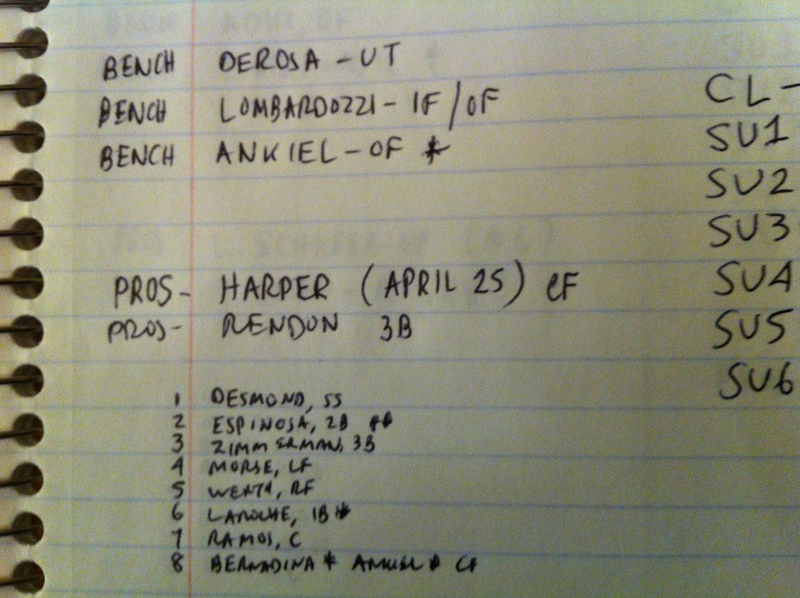 But when Harper looked ordinary in the spring, and anything but dominant in AAA this month, I nearly crossed out the note in order to write “September” instead. 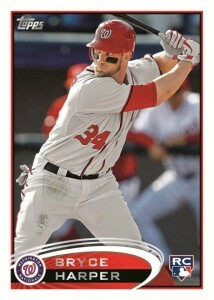 In short, all of us who thought Harper would have played so well that he’d be “up” by April 25 were wrong. …the most amazing question of the spring isn’t about whether or not Harper is going to open the season with the Nationals, nor the one that goes “are the Nats seriously considering it?” The answer is: what happens if it doesn’t work? But Mantle’s demotion came 61 years ago. There was no internet, no cable, no tv sports news to think of, no radio call-ins, no blogs. The Yankees who didn’t get sent to the minors that season included Joe DiMaggio, Yogi Berra, Phil Rizzuto, Allie Reynolds, Vic Raschi, Ed Lopat, coach Bill Dickey, and manager Casey Stengel. They were the two-time defending World Champions and, frankly, it is possible that a lot of Yankee fans had no idea for days or weeks that Mantle had even been sent back to the minors. That will most assuredly not happen if Bryce Harper struggles in the majors – if he bats .211 over 100 agonizing at bats and Mike Rizzo and Davey Johnson decide they have to send him to AAA. The coverage would be intense, uninterrupted, and brutal, and it would not stop the day Harper went to Syracuse or Harrisburg. It would be relentless. Except now, it wouldn’t. If Harper hits .211 over 100 agonizing at bats (or just 50), and the Nats get healthy – gee, he showed flashes of brilliance and we know exactly what the later Harper will look like, but, gosh, Ryan Zimmerman is indeed coming off the disabled list on time on May 6 – the Nats can send him back to Syracuse and tell him and the world that this was the plan all along, see you real soon. Of course, if he’s hitting .290 when Zimmerman comes off the DL, they can abandon the “plan” and stick him in the line-up for good. And that is opportunistic genius. It’s not new – the Yankees did the same thing with Derek Jeter for a long weekend in 1995 when they came up short in the infield – and it’s a mid-season cousin to the standard procedure with standout rookies: bring them up in September and stick them in the line-up. If they succeed, great. If they fail, the season is ending in three weeks, nobody will consider them as having flamed out. Heck, in 1977 the Tigers brought up Jack Morris, Lance Parrish, Alan Trammell and Lou Whitaker over an eight-week span (the latter two debuted in the same game). Same idea, and it works nicely. Of course, with Jayson Werth scratched, Michael Morse lost in some kind of injury ozone, and centerfield a mess, take the odds and wager on Harper overstaying his visit. Heck, he may have to overstay it in centerfield, and the other farmhand just promoted today Tyler Moore (is he a fun guy? Is he a merry Tyler Moore?) in a platoon of some kind in left. The comparisons have been made for years, and tonight one of them comes true. Like Mickey Mantle, Bryce Harper will make his major league debut tonight, slightly out of position, and at the same age – 19. Dismissing for the moment the relative validity of the comparisons of the players, something startling dawned on me this afternoon. We all know Mantle broke into the majors at Yankee Stadium on April 17, 1951, batting third and playing in right field (and wearing number 6) and grounding out to second base in his first at bat against Bill Wight of the Red Sox. Mantle would go 1-for-4 and notch his first of 1509 career RBI on a single that plated the third run in a 5-0 shutout by Vic Raschi. But that wasn’t Mantle’s first game in New York as a bona fide member of the Yankees – and that’s where the startling part comes in. That’s exactly what it looks like. Mantle posing with Joe DiMaggio – at Ebbets Field in Brooklyn. The date is Saturday, April 14, 1951 and it’s part of the annual pre-season exhibition games the Yankees and Dodgers used to play. The seriousness of these games (though they didn’t count) is evidenced by those patches on their left sleeves. It’s the 50th Anniversary of the founding of the American League and the patches were brand new. Mantle has just gotten off an overnight flight from Kansas City, having just again been classified as medically unfit to serve due to osteomyelitis by yet another draft board. DiMaggio played CF and Mantle RF, and in the second exhibition, on Sunday the 15th – as Jane Leavy reports in her epic biography The Last BoyMantle merely went 4-for-4. Update: This was not just Mantle’s first game in New York, it was also his first game in a Major League stadium. In 1951 – and only in 1951 – the Yankees spent spring training in Phoenix. There were no big league parks west of St. Louis then, and when the team began the “tour” that annually preceded the regular season (and to some degree still does) it went west to places like Seals Stadium in San Francisco. On March 26, 1951, Mantle hit a home run at USC’s field that went at least 550 feet, possibly as much as 600. But then came a letter from the draft board and Mantle had to leave the Yankees for nearly two weeks. Note what’s painted onto the press box level in the fabled Brooklyn ballpark. WMGM was the Dodgers’ radio flagship station (at 1050 AM, it had been, and would again, become WHN). But it was just an exhibition game. Would Mantle’s debut have even been on the radio that day? OK, so I can’t find the television listings for April 14th. But there you have it: at minimum, Mantle’s first game ever in New York, on Saturday April 14, 1951, was broadcast by the Yankees’ station (WINS, with Mel Allen and two new colleagues who were replacing Curt Gowdy, named Bill Crowley and Art Gleeson), and was also carried by the Dodgers’ station, WMGM, with their announcers. The Dodgers announcers? In 1951? 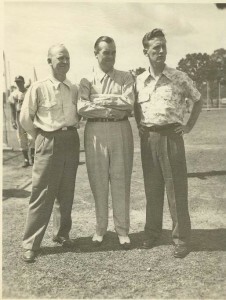 Red Barber on the left, then beginning his 13th year in the Brooklyn booth. In the center, Connie Desmond, Barber’s sidekick since 1942. And on the right, the kid, the local fellow who had just joined the team in the middle of the prior season…Vin Scully. Updating: I asked my old friend (and my second boss) and Dodgers’ broadcaster Charley Steiner to check with Vin this evening to make sure he didn’t have that weekend in 1951 off for some reason. Vin says he has no recollection one way or the other (I mean, it was at least 10,000 games ago) but doesn’t think he wouldn’t have been working the exhibition games, especially the ones in New York, and recalls doing so throughout that era. So I think it’s safe to say that Vin Scully broadcast both Bryce Harper’s Major League debut tonight, and Mickey Mantle’s first game in New York just 61 years, and two weeks, ago! The list of the top ten Home Run hitters in World Series history is fascinating, but not for the reasons you’d think. Mickey Mantle still leads (and almost certainly will; Albert Pujols trails him by 14, cluster-hitter Nellie Cruz trails him by 15, and Alex Rodriguez trails him by 17). Babe Ruth (15) and Yogi Berra (12) follow. Duke Snider is fourth with 11, Lou Gehrig and Reggie Jackson tied for fifth at 10. The rest of the top ten are three men tied with eight homers each: Joe DiMaggio, Frank Robinson, and Moose Skowron. Bill “Moose” Skowron died today after a fight with cancer. He was 81. He was one of the most appreciated, most fun, most filter-free guys in baseball history (“Keith Olbermann! You look great! But, Jeez, ya put on a little weight, huh?”). For the last 40 years he had gradually become the stuff of anecdotal legend, roaming the various parks of the White Sox and dropping into almost anybody’s broadcast booth and inevitably being asked about the stash of Mantle-signed baseballs he supposedly kept locked away somewhere (“Oh, now don’t start on me about that again, Sheesh, I’m not talkin’ about that again”). What got lost in all this merriment – and that’s the word for it, Bill Skowron was almost unstoppably merry – was that he was a helluva first baseman, mostly for the New York Yankees. And unless somebody gets on the stick, he is going to be in the top ten in all-time World Series home runs for quite awhile. Because while you may or may not be able to prove that there is such a thing as clutch hitting, Moose Skowron played in 39 World Series games, got 39 hits, hit his eight homers, and drove in 29 runs. He slugged .519, hit two homers in the same Series in two different years, and in the dramatic 7th Game in 1958, with the Yankees having just broken a 2-2 tie in the 8th Inning, he hit a two-out three-run job to kill off the Braves and Lew Burdette (who had only won the Series from the year before by pitching three victories for Milwaukee). Something else to consider about this cascade of stats. Moose would be the first person to tell you he was no Mickey Mantle and certainly no Babe Ruth. But he put up World Series numbers that approach both of them, with far fewer opportunities. In his first three Series, Skowron was platooned by Casey Stengel. He only batted four times in the ’57 Classic. Skowron only had 142 World Series plate appearances. 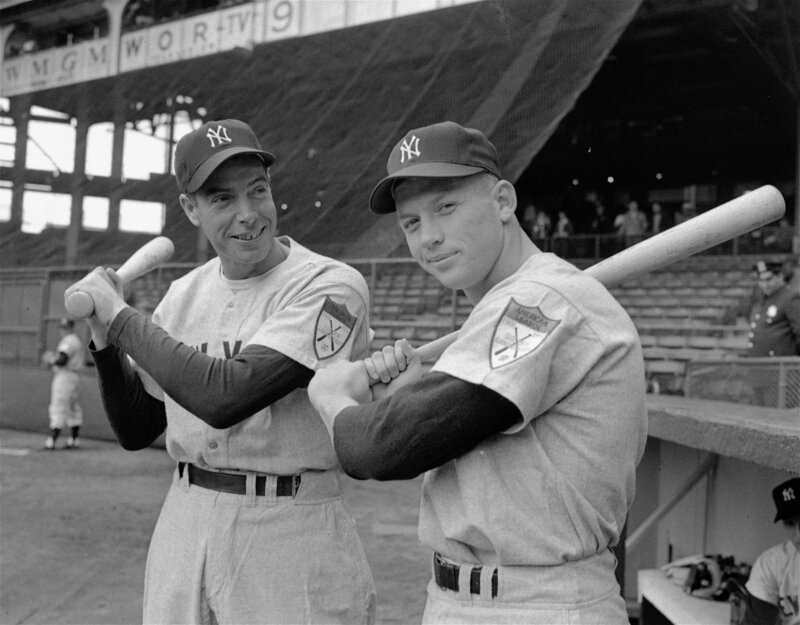 Mantle had 273, Berra 295, DiMaggio 220. Mantle homered once every 15.2 ups, Skowron once every 17.75, Berra once every 24.6, DiMaggio once every 27.5. The RBI rate is even more impressive. Rewrite that list based on plate appearances (lower is better), with the caveat that a tack-on Grand Slam, like the Moose hit in Game 7 in 1956, can go a long way. Again, Bill’s explanation for this was pretty easy (“I was real lucky”). In point of fact, he produced in this way even though, almost invariably, Mantle, Berra, and later Maris, were batting ahead of him. As often as he might have added tack-on runs, he was probably much more often coming up after one of the epic sluggers had cleaned off the bases. He hit when it counted. End Of Story: The 1912 New York Yankees. This post contains new material and much reworked from Friday’s. I thought we had cleared this up yesterday, but evidently not. Now my old friend Joe Buck has repeated a mistake that has unfortunately attained the aura of official history. 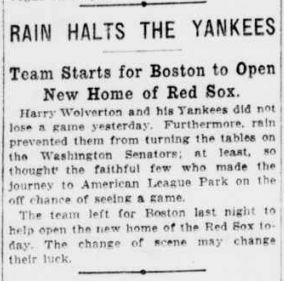 Simply put, when the Boston Red Sox opened Fenway Park 100 years ago Friday, the faithful would have called the visiting team “The New York Yankees” – not “The New York Highlanders” (we’ll leave out any more troublesome things they might’ve called them). 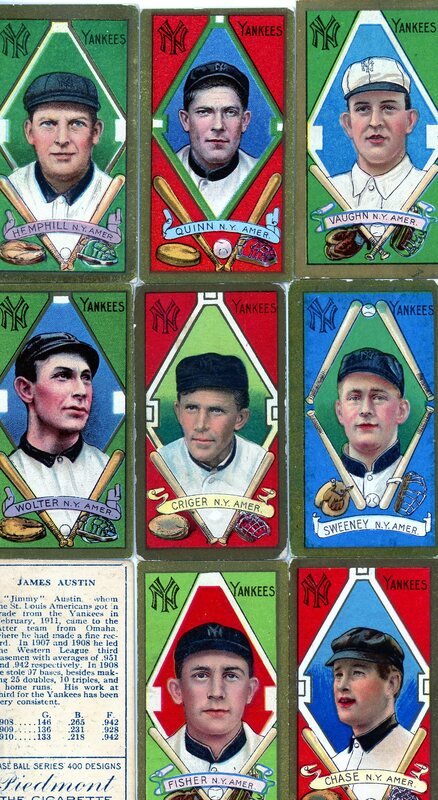 Below you’ll see the 1911 baseball cards issued with the brands of the American Tobacco Trust, labeling the New York players “Yankees,” plus a newspaper supplement from 1907 showing a team picture of the New York Yankees. “Today we think the field was commonly called Hilltop Park, and the team commonly called the Highlaners. But in the first decade…the team was also better known as the New York Americans or the Greater New Yorks. On opening day (1903), the Telegram called them the Deveryites. Sam Crane in the Evening Journal was determined that they be the Invaders. In those days, team nicknames were far less formal. It was, for example, more common to say the Bostons or the Boston Americans than to call them the Red Sox or the Pilgrims. The further back you go before the rust formed around the official history, the further it becomes clear that until the owners officially christened the team in 1913, they were known informally by many names. “Yankees” seems to have been an early favorite, “Americans” being the default second choice (just as it would’ve been for the Cleveland “Americans” or the Detroit “Americans” or – translated to the other league – for the Philadelphia “Nationals”). “Highlanders,” “Hilltoppers” and “New Yorks” brought up the rear. I first heard the story of the slow evolution from “Gordon’s Highlanders” (the name of a famed British army regiment of the time, which stuck because the first team president was named Joseph Gordon, and because their ballpark was at one of the highest spots in New York) to the Yanks in Frank Graham’s first version of The New York Yankees in 1943. At that time, a lot of people who had seen the full 40-year history of the franchise were still alive – Graham, who became a sportswriter in 1915, included. I read the copy my father had had since childhood, either in 1967 or 1968. So the Yankees were the last people to call themselves the Yankees and as Graham wrote nearly 70 years ago, the nickname had been generally adopted before the club went through the formality – in 1913. The key to all this is Appel’s observation that nicknames were informal until the clubs began to realize they were marketing and merchandising opportunities, which probably didn’t take place until the 1920’s. Official MLB history and fans have totally reversed the team name equation. It used to be all about the cities (the 1889 World Series was “The New Yorks versus The Brooklyns”) and this is something that just does not compute to the modern mind. In fact, think of the Dodgers, who began as a new franchise in the then-major league American Association in 1884 with the uninspired nickname “Grays.” By 1888, after a spate of players got married in the off-season, they were the Brooklyn Bridegrooms. In 1899 when Ned Hanlon took over as manager, there was a famous vaudeville troupe called “Hanlon’s Superbas”- thus they became the Brooklyn Superbas. The name outlasted Hanlon, and only faded when Wilbert Robinson took over as manager in 1914 and the name changed again: Brooklyn Robins. Throughout this whole time, the fans and sportswriters used, as a kind of alternative nickname, the term applied to Brooklyn fans who were in constant danger from the labyrinth of streetcar lines throughout the city: “The Trolley Dodgers,” or, simply “Dodgers.” So when Robinson left after the 1931 campaign, the club formally declared themselves “The Dodgers” (but didn’t put the name on the uniforms until 1938). How did the Dodgers treat this confusing history? They declared their 100th anniversary to be 1990, which wiped out the 1884-89 time frame and the team’s first trip to the World Series. And just think, we can go through this entire history controversy year after next. 2014 will be the 100th Anniversary of Wrigley Field. Only it wasn’t called Wrigley Field in 1914 and the Cubs didn’t play there until 1916. First, back across the country and the Yankee photographic evidence. Tip of the cap to my fellow SABR member Mark and this evidence-filled blog on the issue. He gives prominent attention to headlines from the New York Sun about the 1912 “Highlanders.” Getting lesser play? This clip from the New York Tribune, which echoes the aforementioned Times headline: Interestingly the Sun folded in 1950. The Tribune was still breathing (after a series of mergers) in 1966. The Times is still in business. 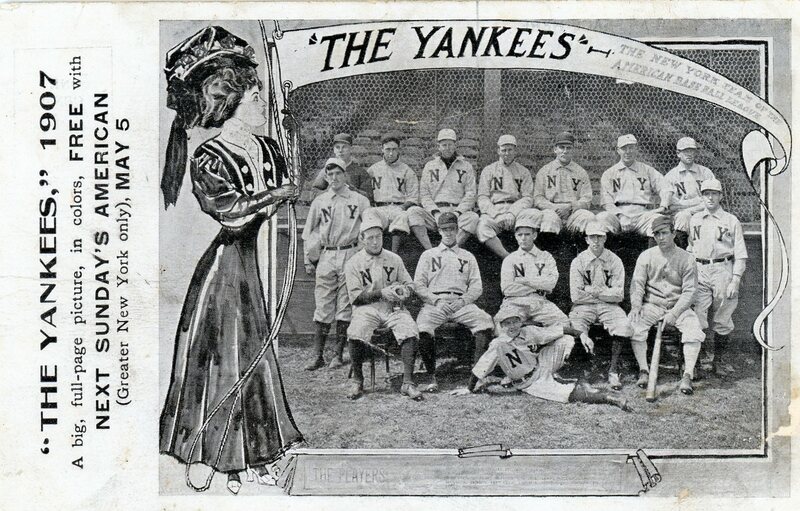 That is a postcard advertising the following Sunday’s edition of The New York American newspaper, which was to include a full-sized version of the 1907 Yankees team picture. This was just after 1907’s opening day, five years before the christening in The Fens. By the way, “Quinn” in the top row? That’s Jack Quinn, whose oldest-victory mark was just broken by Jamie Moyer. These are 1911 cards. Quinn is also in the 1933 set. In point of fact, the Yankees were the Yankees before the Red Sox were the Red Sox. Created in 1901 when the American League was founded, the Boston team was known variously as the Pilgrims, and simply “The Americans” (as opposed to “The Nationals”), the new team drew much of its talent from the successful, but eminently cheap National League team in Boston. From its earliest days in the National Association (1871) and N.L. (1876) that team had worn red stockings, and were once formally known by that name. In 1907, the N.L. team’s manager Fred Tenney became worried about the threat of blood poisoning supposedly posed by the red dye in the socks getting into spike wounds. By year’s end, he had convinced owners John and George Dovey to eliminate the color from the uniforms. A block away, where the nascent A.L. team was struggling to gain a foothold in what was still a National League town, owner John I. Taylor immediately jumped on the opportunity and announced his team would don “the red socks” in 1908 – and a name was born. The Yankees were the Yankees by 1906. The Red Sox weren’t the Red Sox until 1908. Parenthetically, the N.L. team’s next nicknames – the Doves, for the Dovey Brothers, and, in 1911, the Rustlers (because Doves increasingly sounded stupid) – didn’t catch on. The Doveys sold out in 1912 to a bunch of New York politicians from Tammany Hall. Since that organization had a Native American for its logo, its operatives were known as “braves” – and thus the Boston N.L. club adopted that name, and have carried it since. In fact, a week ago Wednesday was the 100th Anniversary of the first appearance of the Braves. Kudos to the Red Sox for taking the concept of the mega-ceremony to a new level. Whereas the Yankees closed the old Stadium in 2008 by putting a comparatively small group of all-time greats on the field at their old positions, the Olde Towne Team went the egalitarian route, and for once, bigger really was better. The ovation for Terry Francona was terrific, and the scene of Tim Wakefield and Jason Varitek pushing the wheelchairs of the long-ago doubleplay combo of Bobby Doerr and Johnny Pesky was indelible. But to me, just as important was seeing Bobby Sprowl and Billy Rohr and Wayne Housie and Jim Landis and those other dozens of the 230 in attendance whose Red Sox tenures were more cameos than careers. This is the essence of the difference between the franchises. The Yankees are about an elite, and a sense that only the best even matter. The Red Sox – at least until ownership went crazy last fall and cut off its nose to spite its face – have always been predicated on the idea that everybody, great or trivial, has contributed something to the heritage. I will protest, however, on behalf of historical accuracy, the continual references right now to how the opponents in both today’s game and the first ever at Fenway exactly a century ago were the New York “Highlanders.” This is one of those misunderstandings of history that never seems to get straightened out. Yes, the New York American League team was colloquially known as “The Highlanders” when it was moved from Baltimore in 1903. And yes, the name “Yankees” wasn’t formally adopted until 1913. That does not mean the 1912 New York team wasn’t known as the Yankees. In fact the name was in common use no later than 1907. Evidence? That is a postcard advertising the following Sunday’s edition of The New York American newspaper, which was to include a full-sized version of the 1907 Yankees team picture. This was just after 1907’s opening day, five years before the christening in The Fens. They were the Yankees. Not the Highlanders. Stop saying it. Update: Yes, I understand that the Yankees’ official history identifies the pre-1913 teams as the Highlanders and doesn’t assign the “Yankee” name to the teams until after the 1912 season. But this isn’t about a simplified record for people who don’t really care about historical accuracy (another example: the Dodgers claim their franchise began in 1890, when in fact the 1890 team was the same one that represented the old American Association in the 1889 World Series). This is about what the fans at brand new Fenway Park, a hundred years ago today, would’ve called the visiting team from New York. Second Update: As those who never question “history” continued to push back on this idea that because the team didn’t officially call itself the Yankees until 1913 it wasn’t the Yankees in 1912, I decided to go back to where I first heard the story of the slow evolution from “Gordon’s Highlanders” (the name of a famed British army regiment of the time, which stuck because the first team president was named Joseph Gordon, and because their ballpark was at one of the highest spots in New York) to the Yanks. Frank Graham wrote his first version of The New York Yankees in 1943, when a lot of people who had seen the full 40-year history of the franchise were still alive – Graham, who became a sportswriter in 1915, included. I read the copy my father had had since childhood, either in 1967 or 1968. More evidence? 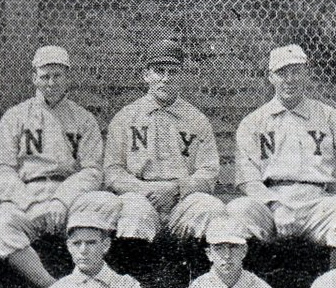 In the biographies on the back (as shown in the lower left hand corner), there are occasional references to “Highlanders.” But the 1911 baseball cards refer to them – unofficial or not – as the Yankees: By the way, “Quinn” in the top row? That’s Jack Quinn, whose oldest-victory mark was just broken by Jamie Moyer. These are 1911 cards. Quinn is also in the 1933 set. This is the latest “preview” of a baseball divisional race ever written. It is penned with the full knowledge of the Dodgers’ 10-3 start, and the injury swarm that seems to be forming in the Arizona outfield, and the demise of Brian Wilson. My apologies: I got kinda behind thanks to Ozzie Guillen and Fidel Castro and stuff. I’ve known Don Mattingly for just under 30 years now. To try to define the eternal nature of Opening Day in a piece for CNN in 1983 I interviewed the oldest old-timer on the Yankees, my late friend Bobby Murcer, and the youngest kid on the squad, a guy who was still wearing uniform number 46 named Mattingly. He didn’t say much, but somewhere there is still a tape of him as the interview closed, thanking me (for some reason). Several seasons, one batting championship, an MVP, and about five Gold Gloves later, I remember going in to the Yankee clubhouse before a game to ask him one question, only to find him answering a question about selecting bats from a fellow fromSports Illustrated. Then there was a second question. And a third. And a tenth. And a twentieth. And Mattingly answered them all. A lifetime later, in his first trip back to New York as a manager, I watched him do every interview, sign every autograph, and smile at everybody who said hello. Finally I asked him how, and why, he did it. “Why not? Doesn’t cost me much. I smile, or I do an impression of a smile, or I’m interested, or I try to be interested, and when I need something from that person, they usually do their best.” I thought that was deeply revealing, and although it might read a little cynical, I didn’t feel that it was. Don Mattingly is genuinely patient with everybody. But when the patience – as it inevitably must – runs out, he manages to simulate it a little longer than the rest of us. This might define the greatest skill a baseball manager can have. This might also define why, in his second season, Mattingly is beginning to be viewed as one of the game’s up-and-coming managerial stars. With no managerial experience at all, he willed a pretty limp ballclub with the worst ownership in the sport in at least a decade, which had four different closers, and exactly one guy with more than 65 RBI, to three games above .500 and the seventh best record in the league. “Everybody else” in LOS ANGELES seems to be named Ellis. They aren’t, of course. But they do have something in common. With the exception of Jose Uribe, they’re all pretty good defensive players, and as he’s shown early, his sub Jerry Hairston can often be a defensive revelation, at least in short bursts. The Dodgers also have a deep bullpen with a lot more depth available in Albuquerque. I am suspicious of the starting beyond Kershaw and perhaps Billingsley. Still, if the starters come through and the inevitable fits-and-starts of young Dee Gordon prove a net-plus, the Dodgers could compete in what is evidently going to be a depleted division. ARIZONA looks like it will be struggling along with a makeshift outfield. This may not be a fatal thing; the team loves A.J. Pollock, and Gerardo Parra is at minimum an asset on defense. But I think the Diamondbacks and those picking them to succeed again in this division are really guilty of making assumptions about the pitching. Daniel Hudson and Ian Kennedy were both likely to correct downwards under the best of circumstances, Josh Collmenter’s success was illusory, Joe Saunders is a journeyman, Trevor Cahill an uncertainty, and Trevor Bauer a rookie who likes to run up on to the mound and throw a warm-up pitch all in one motion and I keep thinking of the late Eddie Feigner, the softball legend from The King And His Court. The dominant bullpen of 2011 is – even if it repeats its success – made up of spare parts (and a lot of them, spare parts the Oakland A’s traded for reasons other than money, which scares me). The Diamondbacks’ best bet might turn out to be a largely rebuilt rotation, made up of Bauer and Wade Miley and maybe even Tyler Skaggs, because I think starting pitching is going to decide the division. That is what SAN FRANCISCO has. No offense, a lot weaker bullpen than everybody thinks (and that was before Wilson’s injury), and the sport’s second-worst management of young players next to the annual abuse drama in Cincinnati. But of course nobody since the 1971 Orioles has had exactly enough starting pitching, and even their four 20-game winners somehow contrived to lose the World Series. Here are Cain and Bumgarner under contract forever, and a revivified Barry Zito, and a Ryan Vogelsong who is surprising even the Giants with unexpected health – and yet there is Lincecum pitching as if that painful-looking delivery of his has become a painful-feeling delivery. With Eric Surkamp ailing and Jonathan Sanchez traded there is very little depth should something prove genuinely wrong with the Little Lord Fauntleroy of the Pitcher’s Mound. And speak to me not of Santiago Casilla and Bullpen By Committee – the problem with the Committee isn’t the need to rely on multiple closers but the way that need deranges the roles of the set-up guys, and without the set-up guys fitting tightly into well-grooved slots, the 2010 World Champs don’t even make the playoffs. This team might fall away quickly, which would at least allow them to audition Heath Hembree as Wilson’s successor (unless Bruce Bochy decides it would be fun to give Guillermo Mota or maybe Al Holland a 47th shot). There is something wrong in COLORADO and it is being obscured by the ultimate feelgood story for rapidly aging fans and writers alike (“Guy Who Cubs Wanted To Make A Minor League Coach 29 Years Ago Wins Big League Game”). It’s lovely to see Jamie Moyer still successful when his exact contemporary Bo Jackson already has an artificial hip and is throwing out the ceremonial first pitch, but it does remind me of Phil Niekro’s relative success in his career codas in New York and Cleveland: What is this, baseball during World War II? All the non 4-F’s are on the richer teams? Where are the Moscosos and the Chatwoods and the Pomeranzes and the Whites and why did you trade for them if you weren’t going to use them? And by the way, why are you auditioning a 37-year old first-time closer? And how come there is no actual third baseman, nor even one in AAA to fill in until Nolan Arenado is ready? This means SAN DIEGO might sneak out of last place. Cory Luebke is on the verge of greatness and Chase Headley might be joining him. If Carlos Quentin comes back early enough to make any kind of contribution the Padres will have a better day-to-day line-up than the Rockies. Their rotations and bullpen already seem about even (though I’m not sure who takes over for Huston Street when they deal him at the deadline). OK. You give me a 10-3 start and the injuries in Arizona and San Francisco and I’ll take the still-long odds against the Dodgers, with the Diamondbacks second, Giants third, Padres edging the Rockies for fourth. The problem, even with two weeks of baseball clarifying the view in the crystal ball, is that all five of these teams have paper-thin depth and another injury (Ethier again? Maybe Tulowitzki’s six early errors are hinting at one?) could topple all forecasts. Again, kind of late. But I do not abandon my forecasts even when the early season suggests they’re bad ones (I’m looking at you, Phillies). In the NL I’ve already picked the Phils, Cardinals and now Dodgers. The east will produce both Wild Cards, probably the Braves and Nationals, and I guess I like the former (though now we see just how much a built-in one-game playoff will blunt not just the last-day excitement, but also predictions – you’re supposed to pick two wild cards and then choose which will win their single-game decider?). Let’s assume the Wild Card winner knocks off the best record (probably St. Louis) and the Phils’ experience propels them past L.A. That means a Braves-Phillies NLCS and I can’t see anybody beating the Phils’ front three. The American League is a little easier. Tampa, Detroit, and Texas win the divisions. The Angels and Jays are the Wild Card and the Angels are likelier to win that. Detroit has the weakest division and thus the best shot at the best record, but sadly all that pitching and all that offense only prevails over intervals of ten games or more when the defense is as bad as it is. Thus the Wild Card Angels over Detroit, Tampa (finally) over Texas, and the Rays over the not-quite-good-enough Cherubs in the ALCS. This leaves me with the same Rays-Phillies World Series I wrongly picked last year, which proves that even making your seasonal predictions 15 days into the season may not be any advantage at all.